Blue Tree Landscaping, founded in 1983, specializes in creating outdoor spaces that respect and enhance the natural beauty of your property and maintain the integrity of your surroundings. With awards from prestigious organizations like PLNA (Pennsylvania Landscape and Nurseryman’s Association) and Suburban Home and Garden, Blue Tree stands out among our peers. As a local business serving Montgomery, Bucks, and Chester counties, we take pride in being an active participant in the local communities we serve. We support the Boy Scouts of America, youth sports organizations and local school and church organizations in our neighborhoods. (610) 222-0590 for more details. Click here to view our portfolio of past projects. Today’s backyards have truly become outdoor living rooms – perfect places for entertaining, family fun and everyday activities. But outdoor living often means we need a little more privacy or protection from the elements. Trees, shrubs or vines can provide a natural answer. Natural screens can be less expensive than fences or walls. 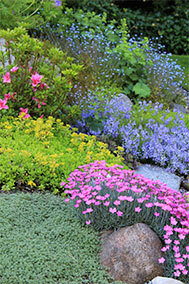 And they can add texture, color and fragrance as well as privacy. Plants can also help control noise, keep dirt and debris from your yard, and protect you and your lawn from too much wind or sun. Where do you want privacy? What do you want to conceal? When planting for privacy, most people want screens to reach just above average eye-level or about six feet. • For maximum privacy, a solid hedge of shrubs works well. 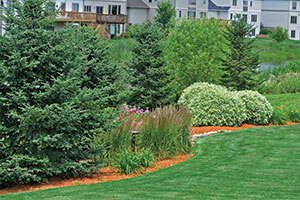 Evergreens provide year-round screening and can be informal or formal, depending on how you trim them. 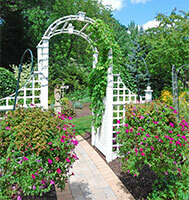 • Vines on trellises are quick growing, inexpensive and work especially well in narrow spaces. • Tall flowers or raised flower beds also give seasonal privacy. 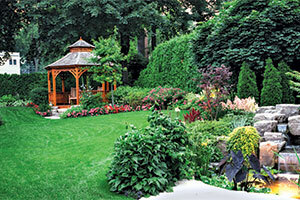 Shrubs, trees and vines can also help you control the climate of your yard for more enjoyable entertaining year-round. Plants can channel air for a soft, relaxing breeze or can create the right amount of shade for that late afternoon barbecue. In fact, the air temperature in the shade of a tree can be 10-15 degrees lower than in an unshaded area. And trees make great defenses against the cold northern winds in winter. Remember, whether you’re looking for protection from the elements or for privacy, screens take time to mature and fill out. Because of this, many people mix a variety of fast-growing plants for quick solutions with slower-growers that will look great over the years. With good planning and a little patience you and your family can create a backyard retreat that provides privacy and comfort for years to come.